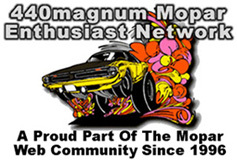 The 440magnum Mopar Enthusiast Network is one of the largest resources on the internet devoted to Mopar related topics. Features include Free Mopar Only Classifieds, Directory, Information, Downloads, News, Photos, Screensavers, Wallpaper, Video and more. Started in late 1996, our Mopars Of The Month site is were we started. The site features a unique collection of Chrysler, Dodge, Plymouth and Mopar related vehicles submitted to us each month. The Mopars Of The Month Archive contains a 20+ year collection of over 5000 related cars and trucks featured in the past. Own a Mopar? Submit Your Mopar to have it featured on our network. Chrysler 300 SRT8 Resources – Dedicated to Chrysler 300 SRT8 enthusiasts and owners. Chrysler Fanatic – Dedicated to Chrysler vehicle enthusiasts and owners. Dodge Challenger Resources – Dedicated to Dodge Challenger owners and enthusiasts. Dodge Challenger T/A Zone – Dedicated to Challenger T/A owners and enthusiasts. Dodge Coronet R/T Resources – Dedicated to the Coronet R/T owners and enthusiasts. Dodge Demon Resources – Dedicated to Dodge Demon enthusiasts and owners. Dodge Magnum Resources – Dedicated to Dodge Magnum enthusiasts and owners. Dodge Super Bee Resources – Dedicated to Dodge Super Bee owners and enthusiasts. My Dodge – Dedicated to Dodge car owners and enthusiasts. My Dodge Charger – Dedicated to classic and modern Charger owners and enthusiasts. My Dodge Dart – Dedicated to classic and modern Dart owners and enthusiasts.